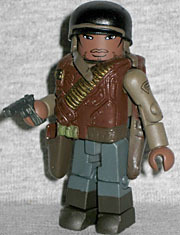 When Rustin bought these figures, he (comically) thought that Gabe Jones was a new character. As you can tell from the links in that article, nothing could be further from the truth. Jones was there from the first issue of Sgt. 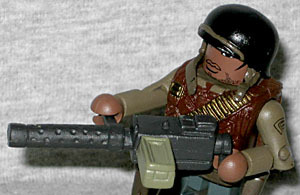 Fury and his Howling Commandos, and has been a regular supporting character ever since. As Rustin raved, Gabe is wearing a really cool military uniform: he gets a very complex vest, with an ammo belt slung across his chest, lots of unusual details on the front and apparently some armor strapped to his back. If you take the vest off, the torso is the same olive green as the arms, so at least he looks like he's wearing a shirt. Gabe has the same helmet as Frontline Cap, just painted in green. The straps, amazingly, look to hang naturally no matter how you turn his head. Take the green helmet off and you'll find painted hair. 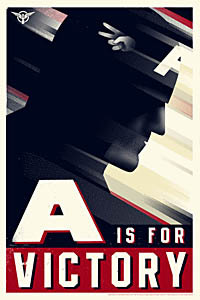 Though the real-world military wasn't integrated until 1948, in the 616 universe the Howling Commandos were the first integrated unit, which is why a black guy can be a member. In the comics, Jones' gimmick was that he carried a trumpet everywhere (Gabriel, horn, get it? ), but since that would be stupid in a war movie like Captain America, he seems to have been changed into the team's heavy gunner. Yes, just like Roadblock. Judging by the way his gun is set up, he's a lefty: the ammo box is on the left and the handhold is on the right. He also has a pistol that fits in the holster on his waist. This set is a Toys Я Us exclusive, but Gabe Jones is actually the only new figure: the second figure is the Hydra Flame Trooper, which was also available in the counter dump. It's not the vanilla trooper, but it's one of the more recognizable versions, since these guys are pretty hard to miss in the trailer, two of them pinning Cap between them with walls of flame. I know a lot of people are complaining that the Hydra uniforms look too modern, but that's hardly the case: they look era-appropriate, but with a science fiction makeover, just like every other piece of technology seen in the film. It's called "suspension of disbelief," nerds! As with the standard Hydra Soldier, the Flame Trooper's head is fully painted with a mask and goggles, then there's a second cap and goggles worn above that. Like we said, weird. 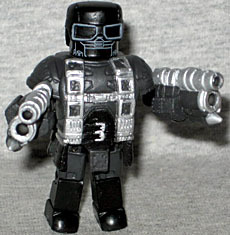 He has a new bulky chestpiece with a large silver H on the chest, and instead of hands, he has his flamethrower weapons. The upper legs are new, too, with fancy armor sculpted on. This makes two Hydra Agents available in the two-packs, and two Howling Commandos. They're both good figures, though Gabe Jones has the edge in coolness. We wouldn't mind seeing some more two-packs with Holwing Commandos in them, since so far the only way to get any is from TRU.